359.900 Fans Celebrate the Performance Party of the Year at Messe Essen The Essen Motor Show 2015 has successfully passed the home straight: From November 28 to December 6 (November 27: Preview Day), 359.900 visitors came to Messe Essen. Europe's leading fair for performance vehicles was once more characterised by enthusiasm and passion. Automobile manufacturers such as Citroen, Ford, Peugeot and Skoda presented new series vehicles or racing cars, the ideal sponsor (ADAC) displayed its extensive commitment to motorsport and the members of Verband der Automobil Tuner even showed several world premieres at the fair. According to a survey of the exhibitors, the targeted interest and concrete questions of the visitors have increased again in comparison with last year. Moreover, the majority of the firms again rated their business success as better than before. As a consequence, the willingness to participate in the Essen Motor Show in the future has risen, too. 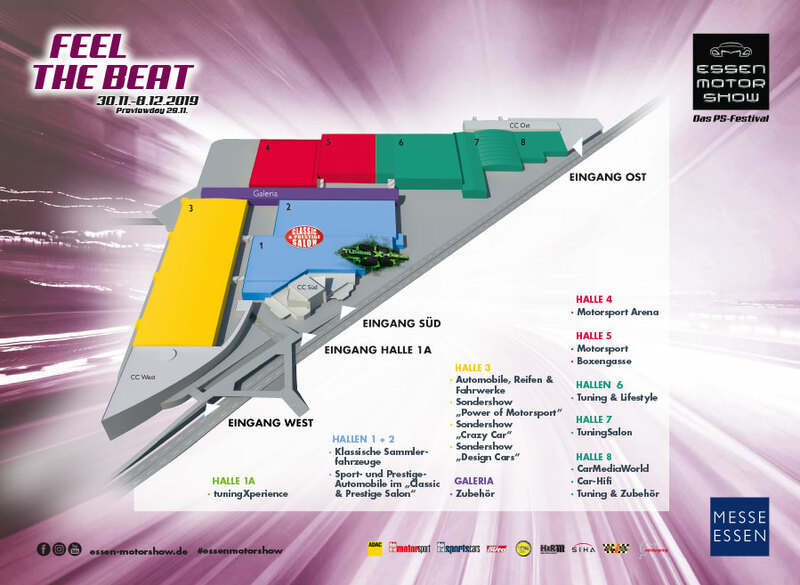 "We are very satisfied with the response from the exhibitors and the visitors. The Essen Motor Show is the ideal mixture of a performance show and a show event. For its fans, it is an experience - at the same time, they use the fair in order to obtain information and to see innovations," according to Oliver P. Kuhrt, CEO of Messe Essen. Attention centred, for example, on new series vehicles such as the Ford Focus RS, the Peugeot 308 GTi and the Skoda Superb Estate. Additional crowd-pullers were the tuningXperience with over 150 private tuning vehicles and the DMAX Motorsport Arena in which, amongst other attractions, visitors could get into a drift taxi. Messe Essen is donating the receipts from the rides to a charitable cause. A racetrack atmosphere was also imparted by the DTM World with drivers and racing cars from Audi, BMW and Mercedes-Benz. 59 percent of the visitors were interested, above all, in vehicle tuning. In this respect, most of the surveyed people stated that they were interested in the ranges offered not only by manufacturer-independent tuners and accessories suppliers but also by the vehicle manufacturers. Moreover, 39 percent of the fans have a particular interest in motorsport and 32 percent in automobile accessories. When questioned about the reasons for their visit, over one third answered that the Essen Motor Show is "something different for once, an experience". In comparison with last year, the purchasing and ordering activities have risen slightly - more than one in two used the fair for purchasing or ordering. For more than half of the visitors to the fair, it was certain that their next vehicle will be a tuned automobile. The Essen Motor Show is continuing to step on the accelerator on the digital highway, too: Around 160,000 fans like EMS on Facebook - thus, it is the automobile fair with the most fans in the social network worldwide. 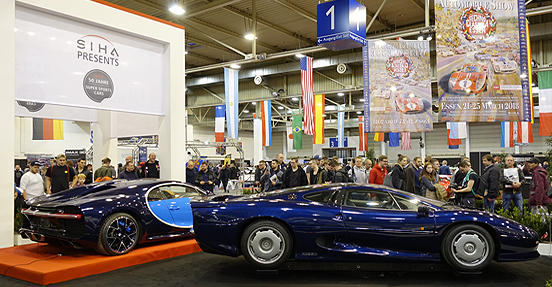 While it was taking place, the Essen Motor Show reached more than two million people there. The Essen Motor Show is Europe's leading fair for performance vehicles. Messe Essen is expecting over 500 exhibitors on the occasion of the coming edition from November 26 to December 4, 2016 (November 25: Preview Day). The range offered by the manufacturers, the dealers and the associations will encompass Sporty Series Vehicles, Tuning, Motorsports, Classic Cars and Motorcycles. These will be supplemented by various special shows as well as spectacular live action in the DMAX Motorsport Arena where manufacturers, racing series and drifters will present themselves. "The Essen Motor Show has once more displayed the enthusiasm for the automobile in all its facets. ADAC has presented to the visitors the diverse world of ADAC motorsport and ADAC classic vehicles. This year, another two highlights at the Essen Motor Show were the special exhibitions about 65 Years of Formula 1 and 100 Years of BMW History and Motorsport. I am already looking forward to 2016." "The Nürburgring was once more satisfied with the Essen Motor Show 2015. In Essen, we encounter precisely our target public. Therefore, this fair is a very good platform in order to publicise the many fantastic large-scale motorsport events on the Nürburgring. As expected, the Le Mans Prototype 919 Hybrid from the World Champion Porsche was the highlight on our booth which enticed a lot of visitors - ideal publicity for the WEC race on the Nürburgring in July 2016. One new feature was the driving demonstration with the Formula racing car of our Driving Academy. The racing car was a double attraction straight away because, on the Nürburgring booth, the visitors could themselves even get into the Formula cockpit and sample a bit of racing atmosphere." "Continental is the innovation and technology leader in the tuning segment. Our new product, the brand-new SportContact 6, emphasises the particular market position in the field of sporty tyres and provides another exclamation mark for all the car drivers who have an affinity for tuning and are only satisfied with the best solution in the premium segment. That is also proven by the latest tyre tests in the trade press. In Essen, we encounter a public which is interested in vehicles and vehicle accessories and has extremely high quality demands. The products of Continental meet these quality demands in a special way. To this extent, Continental's presence in Essen is an expression of the particular market position. Furthermore, not only surveys but also what has been experienced this year prove that fairs for ultimate consumers constitute the second-most-important source of information right after the Internet and have even gained significance recently." "The Essen Motor Show has again delivered what we had hoped for. We have experienced a very great deal of enthusiasm and received absolutely positive feedback about our appearance. A fantastic platform for the presentation of our super sports car, the Focus RS, for the visitors and the media." "Under the motto of 'Formula 1 - Back in Germany', we have come to this year's Essen Motor Show with great anticipation as well as with high expectations at the same time and, I may say in advance, we were not disappointed. Thanks to excellent cooperation with the organisers of the fair, we were able to position ourselves in an appropriate way for the subject in Hall 3, directly adjacent to the wonderful Formula 1 special exhibition. The history of the elite class thus led directly to the present in the form of a current racing car on our booth. The many fans and visitors have thanked us for that with great interest. And the demand related not only to Formula 1 which will come back to the Hockenheimring in 2016 after a one-year break from Germany but also to our entire motorsport programme. Because of the soaring turnover, there were several additional deliveries of the hot-off-the-presses event flyer during the period of the fair." "For us, the Essen Motor Show was a fitting stage in order to present our sporty GTi family: the new Peugeot 308 GTi by PEUGEOT SPORT and the 208 GTi. Both went down really well with the public and the two-coloured Coupe Franche paintwork of these models offered a fantastic photo motif. However, another optical highlight was provided by our motorsport exhibits: the historic 205 Turbo 16 from rallying and the 208 T16 Pikes Peak with which Sebastien Loeb set a fabulous record for Peugeot in the American mountain race. Peugeot was and remains a major player in motorsport and that is reflected in the series programme, too." "The Essen Motor Show was the first big stage for our brand-new Polaris Slingshot. The interest of the visitors was overwhelming: We had countless curious visitors on our booth, a lot of detailed questions came from the motor-mad public and we were able to hold a large number of intensive discussions with people interested in purchasing. The taxi rides in the DMAX Motorsport Arena were the icing on the cake and enthusiastic passengers grinning from ear to ear make us happy, too." "The Essen Motor Show was a complete success for RaceChip. The response at the first weekend of the fair was so good that we already arranged for additional deliveries of more chip tuning modules to the booth at half-time during the fair. The Connect Feature for our RaceChip Ultimate was in particular demand. The visitors have come to us on the booth specifically in order to obtain information. And the wide age distribution has shown that chip tuning has become totally socially acceptable. We will be happy to come again next year." "For many years, the Essen Motor Show has been a permanent fixture in SKODA AUTO Deutschland's calendar of national fairs. In a highly interesting catchment area, it is, with its fascinating mixture of sport, show and automobiles, again an ideal stage for portraying our successes in rallying and our current model range in 2015, too." "After a lengthy break, we have again been an exhibitor in the Classic & Prestige Salon at this year's Essen Motor Show. It has been worthwhile: We are very satisfied and are looking back on a successful fair. The atmosphere was lively and the visitors' interest in our classic vehicles very distinct. For example, we have sold a particularly beautiful Porsche 964 Speedster in deep black from 1993, in addition to several Porsche 356s from the early 1960s. Because of the good response, we can well imagine taking part once more next year." "... stable numbers of visitors on a very high level. In brief: a successful 48th EMS. Experiencing lifestyle relating to all aspects of cars and motorsport in reality. That is only offered by the visit to the fair. The Internet cannot keep up with that!"